"1874 Harry Wright Photo Missing From NYPL's Spalding Collection"
When a “cache of 19th century letters” written to baseball pioneer Harry Wright appeared last summer in the Major League Baseball All-Star Game FanFest auction, baseball historians suspected that the correspondence may have originated from the A. G. Spalding Baseball Collection at the New York Public Library. The New York Times published a series of articles questioning the provenance of the letters and based upon the recollections of baseball historian Dorothy Jane Mills, who worked with the Spalding Collection in the 1950’s, letters from the MLB sale were determined to be property of the New York Public Library. 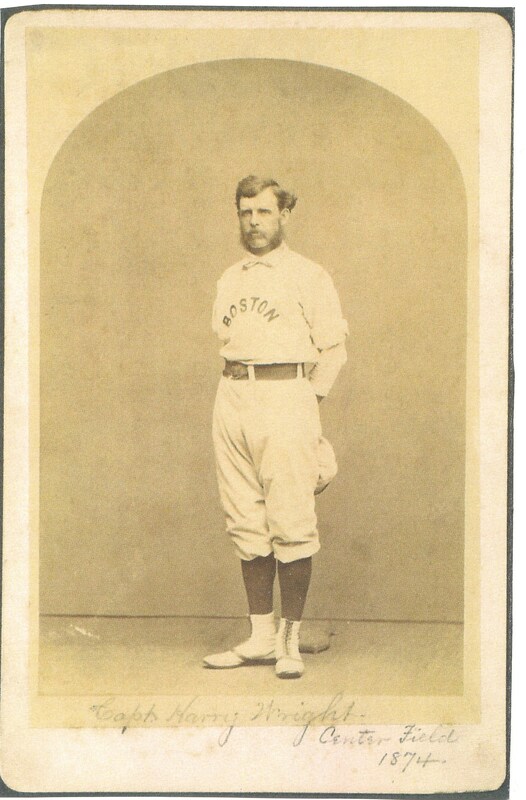 In particular, Mills proved that one letter offered in the auction written by player Jim Devlin was cited in her husband Harold Seymour’s 1956 Cornell dissertation on 19th century baseball. Now, close to a year after the Wright letters first appeared for sale, investigations into the matter suggest that the thefts of baseball artifacts from the New York Public Library were not limited to the group of letters offered at the 2009 All-Star Game auction. An independent investigation conducted by haulsofshame.com has uncovered evidence that links other stolen materials from the Spalding Collection to the now deceased and legendary baseball collector Barry Halper. The investigation has determined that the 1999 sale of Halper’s collection by Sotheby’s also included items that originated from the Harry Wright Correspondence Collection at the New York Public Library. 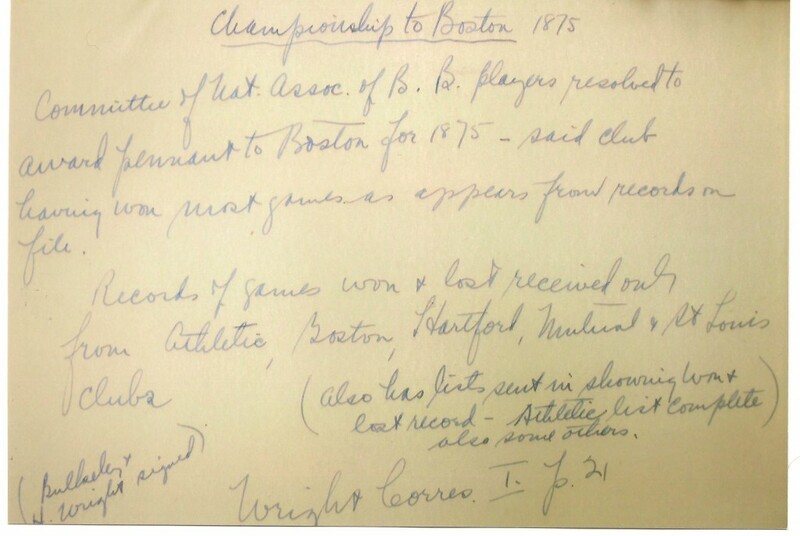 One such item appeared as lot 206 in Sotheby’s $25 million dollar sale of Halper’s collection in 1999 and was described by the auction house as a “historically significant document” that “declared the Boston Base Ball Club the champions of the National Association for 1875.” The letter awarded the Boston team the championship pennant for 1875 and was signed by both league president Morgan Bulkeley and Boston manager Harry Wright. The letter, which was previously offered in the early 1990’s by Richard Wolfers Auctions of San Francisco with an estimated value of “$25,000-30,000,” was sold by Halper at Sotheby’s for $14,950. "Letter Awarding Boston the Pennant of 1875. 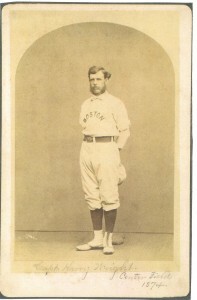 Sold at Sotheby's in the 1999 Barry Halper Auction"
Newly discovered evidence, however, confirms that the 1875 letter awarding the pennant to the Boston team, sold by Sotheby’s in 1999, was once found on page 21 of the New York Public Library’s Harry Wright Correspondence Scrapbook, volume 1. Dorothy Jane Mills and her late husband Harold Seymour wrote extensive research notes when they examined the A. G. Spalding Baseball Collection at the library in the 1950’s and their entire archive of notes and papers were donated to Cornell University in 1994. The Seymour Papers are presently housed in Cornell’s Carl A. Kroch Library as part of the University’s Rare and Manuscript Collections. Harold Seymour’s handwritten notes, recently discovered in the Cornell collection, document that the 1875 letter once owned by Barry Halper is the property of the NYPL. 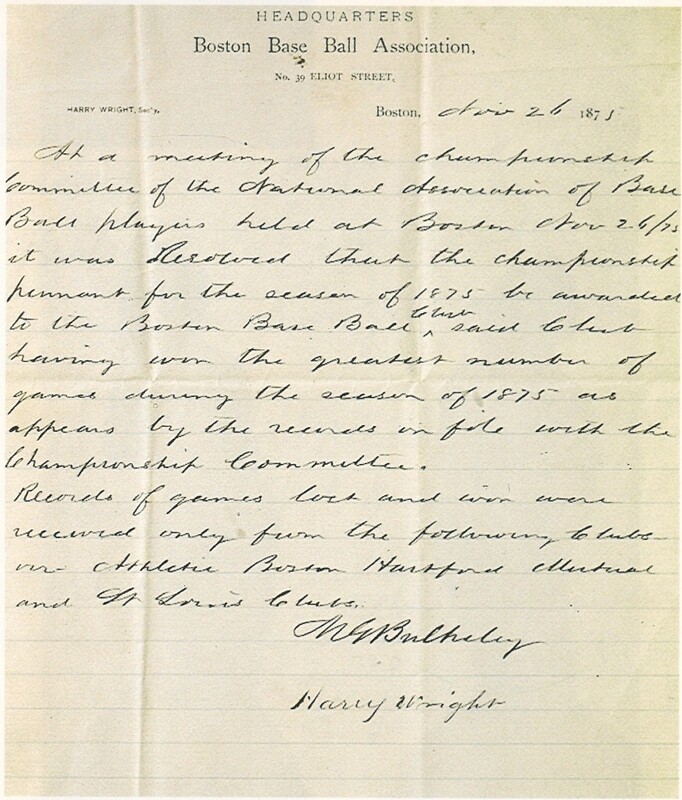 The content of the original 1875 letter sold by Sotheby’s states: “At a meeting of the Committee of the National Association of Base Ball players…it was resolved that the championship pennant for the season of 1875 be awarded to the Boston Base Ball Club, said club having won the greatest number of games during the season of 1875 as appears by the records on file…” The letter was also signed by Hall-of-Famers Morgan Bulkeley and Harry Wright. The Seymour note serves as unimpeachable evidence that the letter sold by Sotheby’s was once part of the Spalding Collection and wrongfully removed from the NYPL. When informed of the revelation provided by the Seymour Papers at Cornell, Dorothy Jane Mills stated, “I’m glad to know (our notes) were helpful in tracking the ownership of stolen materials.” The haulsofshame.com investigation into the Wright thefts has uncovered other documents housed at Cornell that support NYPL’s ownership of additional items that have been sold at public auction, including an 1879 contract signed by Boston player Ezra Sutton. "Original Notes of Dr. Harold Seymour c.1953 From the Rare and Manuscript Collections at Cornell Univ." The correspondence of Harry Wright was donated to the NYPL in 1921 by the widow of Baseball Hall-of-Famer Albert Spalding. The collected letters and documents of Wright were compiled in four volumes of scrapbooks constructed by the NYPL in 1922. The library is still in possession of one volume of the correspondence, but the other three volumes have been missing from the collection for decades. When historian John Thorn and other groups, including the Baseball Hall of Fame, funded the microfilming of the NYPL’s Spalding manuscript collection in 1983, it was officially documented that the three volumes were missing. The three missing volumes of Wright’s correspondence are believed to have contained well over a thousand documents pertaining to Wright’s career in baseball from 1866 to 1894. Sources indicate that the FBI’s investigation that commenced with the sale of the Wright letters last summer is active and that their probe has led to their collecting additional items suspected to have originated from the Wright scrapbooks. The media office of the FBI in New York declined to answer whether their investigation had uncovered information as to where Barry Halper originally acquired the 1875 letter. Despite several inquiries to Sotheby’s about the sale of the 1875 NYPL letter, the auction house declined to respond to questions or issue a formal statement. Angela Montefinise, a spokeswoman for the NYPL, confirmed that the library is cooperating with the Federal probe but, due to the on-going nature of the investigation, could not comment further. Excellent job of reporting. I certainly encourage all SABR members, particularly members of our Nineteenth Century Committee to follow these reports and to take particular notice of missing documents and other artifacts from public and private archives and to report such circumstances immediately to the nearest office of the FBI. It’s good to see the New York Public Library is pursuing the recovery of Harry Wright’s Letters. Hopefully the FBI will find where Halper acquired this letter and that may lead to other recoveries of what may to be thousands of documents. Good luck to Wright’s family. Good for you, Dorothy. It is a great that Society for American Research members peruse the auction house catalogs for incorrect information of all sorts, and especially for items known to have been stolen.